At contemporary music festivals one becomes accustomed to expecting the unexpected. However, in the case of Norway’s Only Connect festival, which took place last weekend in Oslo, expectations were overturned in no small part by the weather, due to the country experiencing its warmest May in over 70 years, basking in constant sunshine and 28°C temperatures. As a consequence this was new music not only at its most exciting, but also at its sweatiest, for performers and audiences alike. 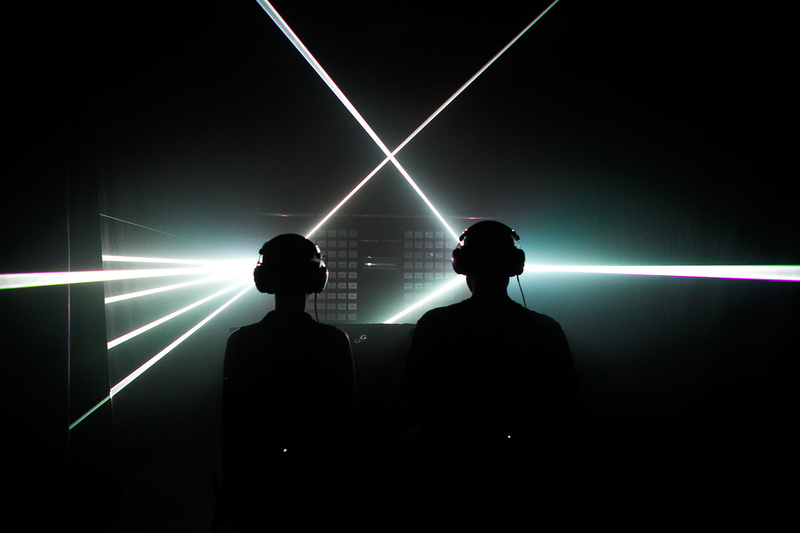 Organised by nyMusikk, Norway’s 80-year old centre for experimental music and sound art, Only Connect’s two days of concerts took the festival name seriously, arranging the concerts such that each day was essentially a journey round or through a single space. Friday’s events took place in the impressive marble splendour of Sentralen, a former bank building converted into a cultural centre a little over a decade ago. Here, the evening was spent progressing around the building (at all times clearly led by the festival’s band of volunteers), performances taking place in the conservatory, up the stairs, in side passages and even inside the old bank vault, in addition to more conventional concert spaces. Two works in particular didn’t merely benefit from but actively exploited this arrangement. 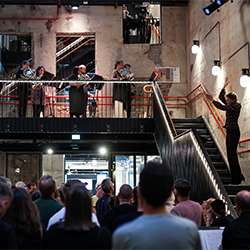 It’s taken nearly 50 years for Norway to hear Gérard Grisey‘s extraordinary Mégalithes, and NyNorsk Messingkvintett + Brasskompaniet really made their performance count, distributing the players in the various nooks and crannies of Sentralen’s vertically huge conservatory, directed from the stairwell by Halldis Rønning. On the one hand Mégalithes showed few signs of its age, yet on the other it sounded, if anything, not so much 50 years old as 50 million, articulating a level of raw elementality that made the work sound positively prehistoric. Despite being widely dispersed, the players nonetheless were clearly all part of a single group, united by the sharing and interplay of their materials, wonderfully executed here such that they never explicitly seemed rhythmic, melodic or harmonic. Somehow these relatively modern conceptions were all rendered irrelevant, producing a performance of something unpredictable and timeless, so primordial as to seem alien. 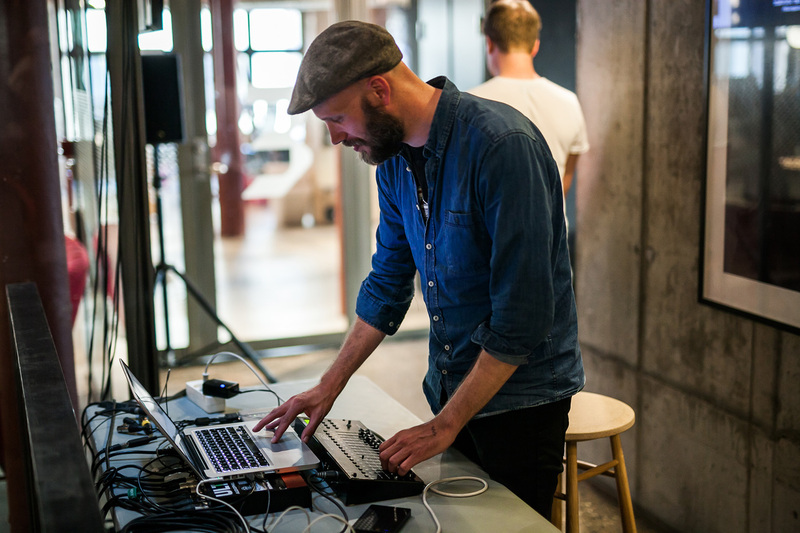 Immediately after, sound artist Anders Tveit utilised the space in a similar fashion, responding to Mégalithes with his own Untitled Echoes for Adjacent Rooms. Listening to Gérard Grisey, a live electronic work in which echoes of the Grisey (taken from recordings and rehearsals from earlier in the week) became a thread running through the music’s core. Tveit had arranged his speakers from the top to the bottom of the space with the elevation of the speakers corresponding to its frequency range – i.e. 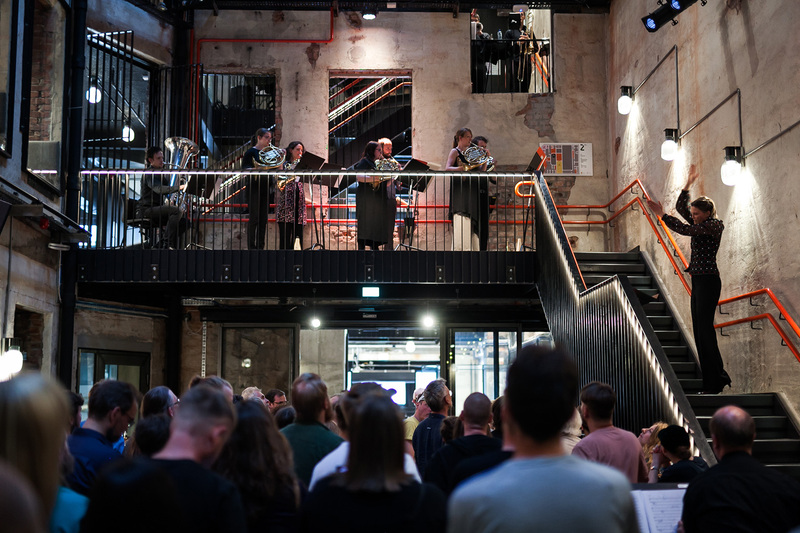 the bass at ground level, the treble at the top of the building – yet from our vantage point on the first floor this separation coalesced perfectly, turning the entirety of the conservatory space into a vast resonating chamber. (For the first time i felt what it might be like actually to sit inside a loudspeaker.) 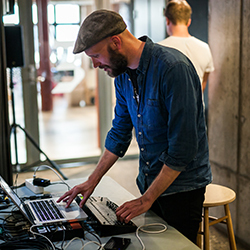 For a live performance Tveit demonstrated beautiful control of the placement and morphology of his sounds, the elements of the Grisey fusing with the electronics to create music that seemed to encompass the entirety of time. It proved to be just as organic as Mégalithes, evolving at different rates but always evolving, harnessing dynamic extremes of noise and lowercase in a way that, again like Grisey, made notions of style irrelevant. It was one of the best responses to another work that i’ve heard which, considering this was a last-minute festival commission, makes it a remarkable achievement. Not all of the sights and sounds along the journey through Sentralen were as compelling as these. i still have precisely no idea what performance artist Ingvild Holm was up to, bedecked in a gold suit and top hat, cavorting and singing next to a sculpture (conversations with other concert-goers revealed i wasn’t the only one with no clue as to what it all meant). 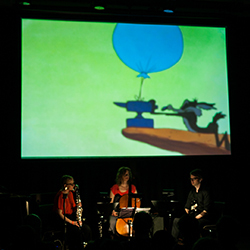 Far more disappointing, though, was Trigger, a large-scale collaboration between Norwegian composer Stephan Meidell, Colombian cinematographer Carlos Vasquez and Finnish graphic designer Petri Henriksson, involving mechanical instruments, live electronics and projectors with material being applied to and erased from their respective film in real-time. It was the live electronics that badly let the work down, detracting from the fascinatingly erratic quirk and convolution of the other elements in a banal sequence of beat-based loops that lacked imagination or flair, exacerbated by its 35-minute duration. But the evening held some truly spell-binding music. The world première of Joanna Bailie‘s Roll-Call (a world première) was intriguing more than it was involving, an act of what one might call ‘speculative hauntology’, presenting tales about the figures on an old panoramic photo of a boys’ school. Pianist Heloisa Amaral slowly dissolved from speaking to playing, her material another example of the ‘extruding’ demonstrated in Bailie’s Artificial Environments. 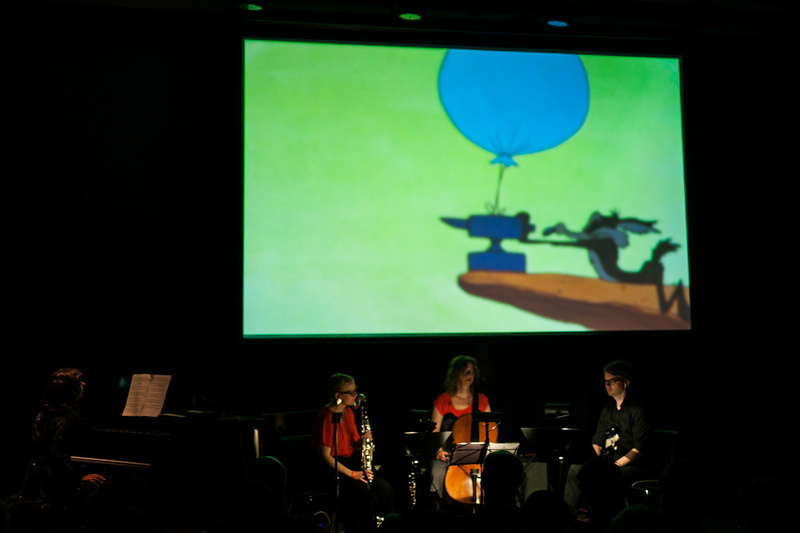 Infinitely more engrossing was Balloon-anvil, the second part of a work appropriating and rethinking frames taken from a Road Runner cartoon. While the first part, Dynamite-barrel, was bizarre and inconsequential, Balloon-anvil was among the most hypnotic and wondrous things i have ever experienced. Presenting the frames slowly, their focus blurred, and given a new sonic context in the form of an exquisite, soft, somewhat ambient soundworld (performed by asamisimasa), Bailie inverted and sublimated the insane pace and violence of the cartoon into a graceful ballet of snapshots that was unexpectedly moving and deeply memorable. 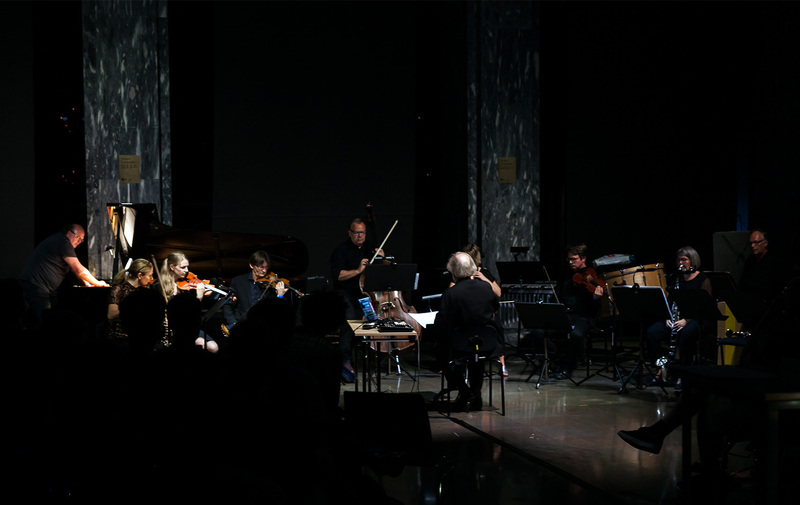 Later still, in Sentralen’s grand marble hall, Cikada Ensemble and the Oslo Sinfonietta joined forces, directed by Christian Eggen, to present works by Christina Kubisch and Carola Bauckholt. Kubisch’s work harnesses sounds we ordinarily cannot hear, which in the case of her 2017 Seven Magnetic Places is electromagnetic waves. The result was music that one might otherwise have thought to be electronic: redolent of both the BBC Radiophonic Workshop and the famous NASA space recordings, the soundscapes created by Kubisch were utterly lovely, characterised by a capricious spontaneity that veered between dronal and highly rhythmic episodes, between drawn-out pitches and clouds of multicoloured noise. Kubisch’s music was new to me, and following this i want to hear a lot, lot more. When i first encountered Bauckholt’s Laufwerk at last year’s HCMF it left me rather cold, but this performance proved much more impactful, the work’s sequence of diverse, behaviourally-defined sections – in which the ensemble seeks to embody the sounds of various prerecorded samples – making for a compelling theatrical and sonic interplay. These pieces were followed by two collaborations, the result of the composers working with each other’s materials. 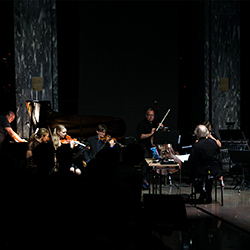 Kubisch’s Wien Landstraße for violin, viola, cello, double bass and electronics really didn’t work, the quartet sounding fundamentally disconnected from the electronics, as though fragments of Bauckholt had been grafted on top of Kubisch’s material. There was one exception, in the form of a quasi-unison slithering in the instruments’ lowest registers, but aside from this it was a frustrating experience. Bauckholt’s Point of Presence, on the contrary, was stunning, impossibly managing to create an acoustic extension of Kubisch’s electromagnetic sounds, integrated so fully and so sympathetically it was as though they were inseparable facets of the very same thing. The most overwhelming site-specific performance at Sentralen was the one i mentioned taking place within the old bank vault. US composer Jeff Carey‘s Precursor to Hypercube is a frantic, four-minute overload of aural, visual and physical stimuli. Even before it begins the work has an unsettling, even intimidating, atmosphere: experienced by just four people at a time, sitting (initially at least) in a pitch-black, relatively small space, restrained by belts to our seats; and if this wasn’t enough, Carey doesn’t allow entry into the vault until a lengthy “Waiver and Release of Liability” has been signed and submitted by each participant. Gulp. What transpired, though, was far from intimidating: an exhilarating firestorm of glitchtronica and light and laser displays, reinforced by intense vibrations channelled through the backs of the chairs. As the music is heard via headphones, the nature of the experience was a curious mix, both individual and part of a group, with differing levels of perceived intimacy; there were times when i felt the roller-coaster effect, enjoying the ride all the more due to being in the company of others, while at other times i felt entirely alone, often moving between these states in the blink of an eye. The ‘hyper’ of the title is felt most in the way we’re caught between simply bathing in the dazzling onslaught of the piece and attempting to parse its rapid-fire behaviour and make connections between its discrete sound, sight and sense elements. 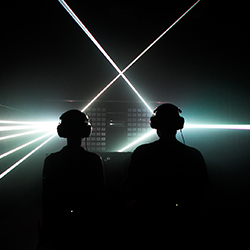 Carey has deliberately rendered this ambiguous: while the music is identical in each performance, the lights and lasers are not; likewise the chair vibrations sometimes correspond to the thuds in the beat textures but to an extent also do their own thing. i was fortunate to experience Precursor to Hypercube twice and it blew me away both times, leaving me hungry for more; that word ‘precursor’ makes me very excited indeed. The short video trailer below provides just a hint of what it was like.